It is no secret that I enjoy self-quantification. Well, if it is a secret, it shouldn’t be. I enjoy self-quantification. Last year, I told my friend Abe (who is gainfully employed by Jawbone) that I like the concept of the Jawbone Up, but I wouldn’t get one until it had wireless syncing and integration with Beeminder. Late last year it got both, but didn’t have Android compatibility, so I waited. This spring, it finally did get the Android app we have all been waiting for, and I decided to try it out, to see what I liked and didn’t like about it. I’ve had a Jawbone Up for about a month now, and I have thoughts about the differences and benefits of each. Which I am now sharing with you. Because I can, and because why not? Well, the Jawbone and the Fitbit are tracking different motions to estimate steps, so there are bound to be differences in the step counts, right? The Jawbone tracks on the wrist, while for me, the Fitbit is on my hip. How do they compare? The Fitbit is almost always higher. 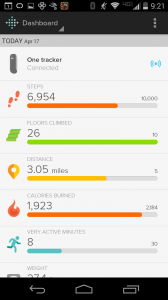 On average, if I exclude Saturdays from my count, the Fitbit is on average 1086 steps per day higher. Winner: Neither has an obvious advantage here. I think that if you are consistent, you can estimate your activity level with either. They aren’t directly comparable though. 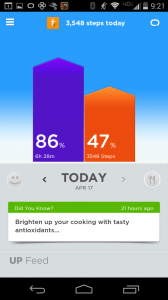 The Jawbone has a distinct advantage for Sleep tracking. I absolutely hate the way Fitbit does sleep tracking. I have to get out my special velcro wristband, and fumble around after I’ve taken my contacts out to get the Fitbit in its special pocket, and then try to push the button, and then hope that the Fitbit doesn’t fall out in the night. Then when I get up, I have to log on to a website to see the details of how I slept. You can imagine I haven’t tracked my sleep with the Fitbit in a long time. With the Jawbone, because I am already wearing it on my wrist, all I have to do is push a button to start the sleep mode, and push a button to stop it when I wake up. The data is (almost) instantly sent to my phone and I get a notification in the app showing me how I did. It is easy as pie to use. I like the silent alarm feature on the Jawbone, which allows me to set a regular alarm and/or set a smart alarm which will wake me when I am not in deep sleep, up to 20 minutes before I need to be up. I have used the silent alarms on the Fitbit, but not for waking up, so I don’t have a direct comparison. Winner: Jawbone, by a long shot. The Fitbit One is a small fob that I generally keep in my coin pocket. No one has to know its there. The Jawbone Up is a bracelet that sometimes doesn’t play nice with my sleeve cuffs. Anyone who is paying attention knows it is there, although they might not know what it is. Is there an etiquette yet for asking people about their self-tracking devices? 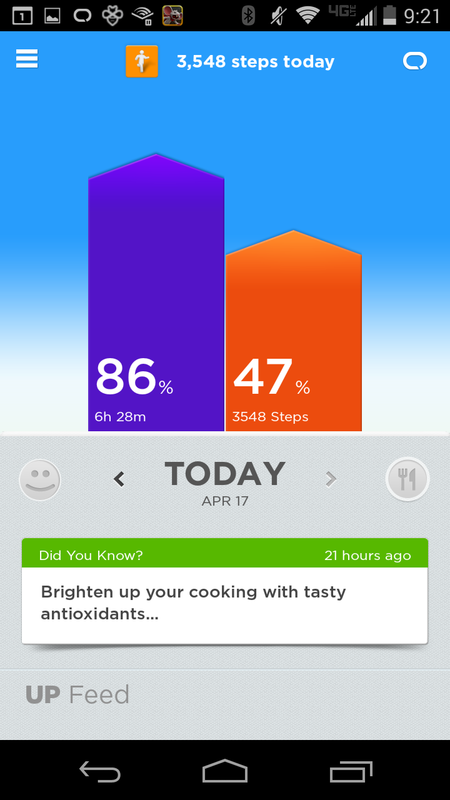 In my opinion, the Jawbone’s app really shines. It just has a friendlier interface, and I think it does a good job bringing the data you need straight to the user’s attention. I particularly like the cards that pop up every day giving me information about how my habits stack up and how I can improve them. On the downside, the Jawbone App tends to be a bit crashy for me. Don’t know if that is just me and my phone, or if it is a common problem for others. I don’t have anything bad to say about the Fitbit app, but I don’t have anything great to say about it either. It is functional, it does what it is supposed to do. Powernaps – when I need a quick nap, it will rouse me in about 25 minutes. Perfect! Integration with IFTTT – Makes getting data into Google Docs really simple, plus SmartThings integration! For the life of me, I cannot get the Stopwatch mode to fire consistently. It doesn’t have a website where I can check data. I don’t like being constrained to my phone. Also, no tablet app? This is tiny, but I hate that for Android it has to display a permanent notification that it is syncing via BlueTooth. I understand why it has to be, but I don’t have to like it. My notification space is precious to me. 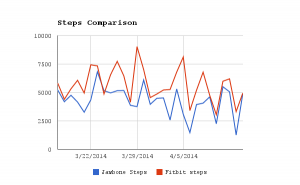 The Fitbit website has your data visible and you can do crude analysis there. I like the previous version of the site better than the current iteration. Chatter – When I pick up my Fitbit, it greets me by name, tells me , and sometimes tells me that it loves me. 😀 Who doesn’t love a pocket computer that cheers you up? Instant feedback – If I want to know how I’m doing, I just pull it out of my pocket and push a button. It is hard to get the data out of Fitbit’s greedy little hands. It is doable, but it is not easy. Until recently, it required a computer connection to sync. That was annoying if I was travelling and wanted to make sure I didn’t hit a Beeminder eep! day. Now it will sync with my phone. It is super easy to lose. I have never washed it, but it has fallen under my bed and gotten temporarily lost on numerous occasions. At the end of the day, both of these devices seem to be good activity trackers. They both have their quirks, and they both approach the question of self-quantification from different angles. The only place where there is a clear outstanding winner is with Sleep Tracking. 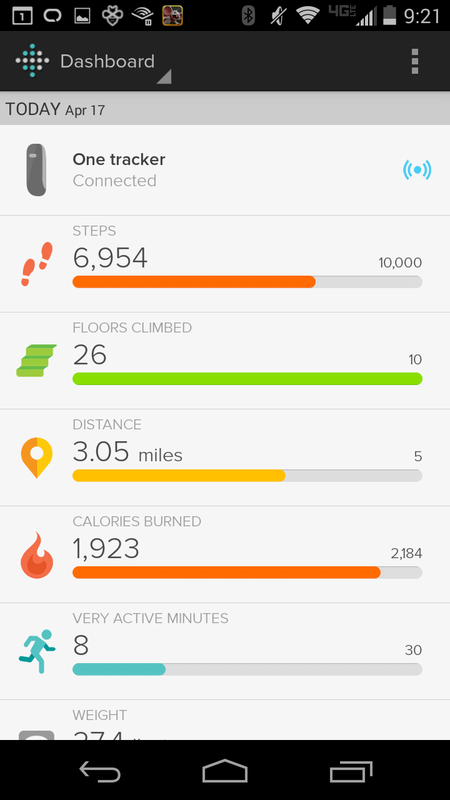 If you are interested in that, Jawbone Up is the way to go. Otherwise, it really comes down to personal preferences. Each does some things better than the other, but I don’t think there is a clear standout. I recently finished reading Zingerman’s Guide to Giving Great Service. I’ve been obsessing with Zingerman’s Bakehouse breads lately and I have a Zing BAKE! class on my schedule for later this month, so when I saw this book on the audiobook shelf at the Library, I jumped at the chance. I wanted to call out and give examples of two companies that recently left me pleasantly surprised by their approach to customer service. The first is Woot.com. I had recently ordered a box of batteries. (Skynet is eating them for lunch.) When I got the box, I opened it up to find that instead of 72 AA batteries, I had 72 AAA batteries. In all of my life, I don’t think I will use that many AAA batteries. I wrote in to ask about an exchange, because I really did want those AAs. I got a quick email acknowledging that my correct order was on its way. A day or two later, Woot sent out the following email, presumably to all the customers who had purchased batteries during that particular sale. How many times have you gone to the store to buy AA batteries, picked up what you thought was the correct package, paid for it, taken it home… and only then noticed you bought the wrong freakin’ type? You always feel kinda dumb, right? Now imagine if you did that something like one thousand times in a row. Which is our way of saying that yes, we DID finally notice that we sent you the wrong batteries. If you ordered AA you got AAA and vice versa. We’re the goofballs here and we’re sorry for the mistake. Now, let’s tell you how we’re makin’ it right. FIRST: keep those batteries we sent you. Put ’em in your remote or your smoke detector or penlight or whatever. They’re yours now. Enjoy! SECOND: Be aware we’re sending you the batteries you actually wanted, at no additional charge. They’re the ones you asked for, right? Of course you still want ’em! And please, learn from our mistakes. Always count the number of A’s in your battery type. Always. I have long loved Woot for the sense of humor that they bring to everything that they do. Thank you very much for all you have done for our company. If you have any questions, I am all ears. I really look forward to hearing from you soon! Thanks for cancelling my account! Thanks for kind let down haha I speak for the entire NatureBox family when I say, I am sad to see you go 🙁 That being said, I’ve gone ahead and cancelled your subscription. We will not charge your card from this point forward and you should receive an email confirming this shortly. I don’t know if you caught that, but my professional snack conceirge played along with me. He had a script, sure, and what kind of customer service rep doesn’t, but he broke out of it to respond directly to me and it honestly left me with a huge smile. If I didn’t have a rule about how many subscriptions I can have at any one time, I totally would have resubscribed right then and there. I still highly recommend it (If you want to try it out, this is my referral link: http://fbuy.me/MFds you get $10 off, and I get a $10 credit, which I will happily spend). So, that’s how you do great customer service. Have you had any good experiences with customer service? What about awful ones?